“I visualized that last lap being in a lot of pain in Poland and having to dig deep, running against the best in the world. I’m always trying to mentally prepare myself for the next step. I believe that I can mix it up with the best in the world"
- Shalane Flanagan after her dominant 51-second win in the 8km USA XC championships. Is 3:55 the new 4:00 mile? 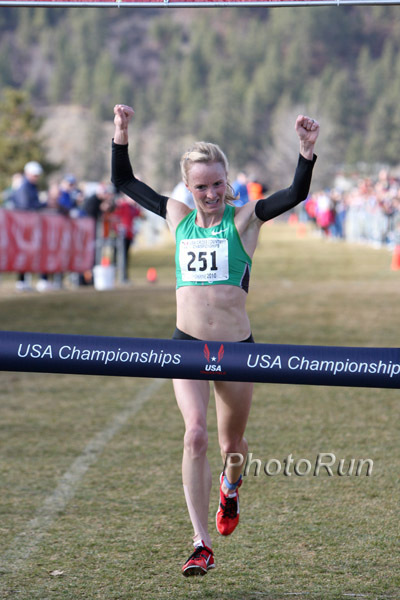 LRC Favorites Flanagan and Ritzenhein Earn Big Wins At USA XC Champs Shalane Flanagan won by a massive margin leading from the gun while Dathan Ritzenhein pulled away smoothly to get expected wins. See who else qualified to run the World Cross Country Championships in Poland in March. Reigning World XC Champ Florence Kiplagat Will Not Defend Title Flanagan's quest for a world XC medal will be tough but she won't have to face the 2009 champion. Flanagan really crushed the field while Ritz just blew them away the final 2.5k. They both showed why they were the heavy favorites on Saturday. Trevor Dunbar and Shelby Greany won the junior races. Sam Bair III Joins Father In Sub-4:00 Club Bair and 12 other men broke 4:00 in Washington last night. Iowa State's Lisa Koll Returns With 15:26, 2nd All Time In NCAA Koll is the NCAA record holder for 10,000m (set in 2008) but had a terrible 2009 with injuries. Now only Jenny Barringer is faster than her indoors at 5000. Sergio Sanchez Sets European Indoor 3000m Record With 7:32.41 *LRC Boards: Is 7:32 5000m man Sergio Sanchez the Real Deal? 19-Year-Old Gregson Opens Season With 3:37 1,500m Down Under US rival German Fernandez should be racing in Washington this weekend.